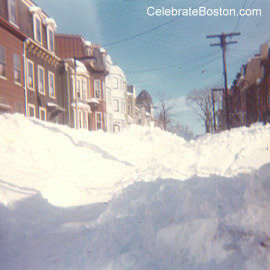 Every 10 years or so Boston experiences a severe blizzard, where snow accumulation can exceed two feet in a short period of time. The Blizzard of 1888 impacted areas west of Boston, and the Blizzard of 1978 dropped more than 27 inches of snow, just a week after a 20-inch storm. Basic preparation for a snowstorm, or for any natural disaster, can save your life. The riskiest areas during a blizzard or nor'easter are near the ocean, where tidal surges can inundate low-lying areas and isolate entire neighborhoods from civilization. The following article was written by a 20-year veteran of the U.S. Armed Forces, and presents a scenario of a large blizzard in a densely populated area. It also conjectures what could happen if a person decides to walk home during a blizzard, or is stranded outdoors for a period of time. Always seek professional advice to learn survival methods. This article should not be considered advice or construed as such. There has always been a lot of emphasis placed on wilderness survival because people fear becoming lost away from home. They fear dehydration, exposure to the elements, hunger, and being alone. Some may fail to realize that an individual can succumb to dehydration right in his or her own home due to a natural disaster. You could also be caught outside during a blizzard walking home from work or from the supermarket. In the middle of a blizzard on foot, you are truly alone. Starting out you have no idea of the extent of the blizzard. You don't know it now, but this blizzard will eventually drop 3.5 feet of snow over two and a half days. A staggering amount of snow that poses a serious threat to everyone, even if they are huddled insides their homes. The 15-foot drifts alone will bury cars and cover doorways. You also realize that if you succumb to the cold, the snow drifts can bury you, as well. You realize that the mile walk back home will not be comfortable but you must get home, your family is waiting. Hypothermia is a medical condition that is diagnosed when the body loses heat faster than it can generate heat. Once your core body temperature lowers to 95 degrees Fahrenheit, you have hypothermia. Heat loss can occur from any exposed skin. Unprotected heads, necks and wrists lose the most heat when left exposed to cold air. Large blood vessels such as the carotid in the neck transport blood directly to the brain and this vessel is close to the surface. The blood is cooled rapidly when the neck is exposed. The cooling blood is then transported to the brain slowing cogitative thought. Wrists also have large vessels close to the surface. These must be protected to allow the body to warm itself. Otherwise, the body will cool faster than it can warm itself. Once the blood cools to your hands you will lose function in your fingers. Soon your fingertips will be frostbitten if not properly protected. Note: A person is more susceptible to hypothermia when their clothes become wet. If your clothes become soaked through to your skin you must remove the clothing as soon as possible. The moisture will draw your body heat away, it is almost impossible to overcome hypothermia with wet clothes in cold temperatures. Wet clothes lose over 90% of their insulating abilities. Once your body's core temperature is lowered, movement becomes more difficult. Alcohol in your body will also make you more susceptible to hypothermia because of the thinning of the blood. Get out of the wind at all costs even if it means knocking on doors and requesting shelter, or building a snow shelter as a last resort. Clothes must be dried before they can regain their insulating properties. Walking keeps the blood flowing, the blood is transported to the inner body to warm up, and is then transported to the surface to warm skin. You must keep moving in the cold. However, excessive sweating under your clothes will cause evaporation, which cools the skin and ultimately the blood vessels. Ideally, you would have layered your clothes and can remove one layer to prevent excessive perspiration. You must cool down to warm up. Note: Wool is the best material for insulation. Unlike other materials, wool will insulate better even when it is modestly wet. Wool will wick the perspiration away from the skin thus, slowing evaporative cooling of the skin. Getting out of the wind and catching your breath will slow perspiration and short breaks are recommended when walking in the cold. You must find a spot shielded from the wind and falling snow. However, do not linger, five minutes at most and continue. Walk close to structures to break the wind and avoid heavy snows because, breaking through deep snow wears you out quickly. Walk under eaves or overhangs as much as possible. You must keep walking to survive. Keep an eye out for snow or ice dams on roof eaves that can fall on your head. Watch out for overhead wires that may become heavy with snow and collapse, or be knocked down due to high winds. Note: If you are physically exhausted or believe you have hypothermia, the prudent decision is to seek shelter in a structure or to knock on a stranger's door and request shelter. Some form of communication will likely be functional in a blizzard, such as a cell or wired phone for you to contact your family if you are stranded. Attempting to walk home during a blizzard can lead to frostbite or death. The power is out, so no soaking in a hot bathtub to warm up. The first thing you must do is remove the clothes you are wearing and wrap yourself in a blanket; a solar heat blanket is preferred. Hypothermia will reverse itself if you warm up quickly. You have to absorb heat and prevent your skin from transferring heat to the outside air. The heat in your home is off due to the storm, no lights, no water and no gas supply. Water is not a problem; melted fresh snow can be consumed without purification. Do not chew or eat snow, it will lower your body temperature. Simply allow fresh snow to melt on its own in a clean container. Heat transfers by convection and conduction from warm space to cold space. Walls and any building materials will conduct heat unless a radiant shield—insulation—is in place to prevent heat loss. Heat conducts into the home in the summer, mainly through the roof. In the winter, heat escapes through convection, by rising to the ceilings, and passing through walls and the roof. A very warm home in the winter loses heat faster than a relatively cool home, which is why it is more energy efficient to lower your thermostat at night when it is the coldest outside. By cooling your home, you slow the heat transfer. The home will eventually become cold. It could cool down to between 45 and 50 degrees Fahrenheit within three days. Keep wrapped in blankets to prevent heat loss. Stay wrapped at all times. Only go outside to gather snow for melting. Everyone should sleep in the same bed for warmth. Shut the doors of any non-essential rooms to keep heat concentrated in the kitchen and living room area. Hang blankets over any sliding glass doors to prevent heat loss. Remember cold does not creep in so much as heat escapes. The following is a list of supplies that you can gather and have ready in the event of a blizzard. Keep in mind these items can be used for any disaster. Water supply during a blizzard will not be a problem. However, this does not mean you should not store water over the winter months. Ice storms and high winds can cause power outages and you may not have any snow as a water source. You should consider items for cold weather when autumn changes to winter and temperatures begin to drop. Concentrate on clothing and supplies that help keep you warm. 5 To 7 Day Supply Of Meals Ready To Eat (MREs). Also, Any Canned Goods That Do Not Require Preparation. Children Will Need Snacks And Healthy Fruit Drinks. 5 To 7 Day Supply Of Water, One Gallon Per Person. This Includes Personal Hygiene Needs. Even though canned foods and MREs can be eaten cold, a hot meal is a morale booster and gives everyone a sense of normal during a crisis. Heat gel in cans are designed for chaffing pans that are elevated in a holder. The cans are placed under the pans. Elevate the cooking pan, kettle or fry pan above the gel can; you can use bricks, stone, tile or any non-flammable material if necessary. Rest the pan on the material, with the gel cans between the objects, so there is at least two inches between the can and the cooking surface. You can heat food in the can by leaving the lid partially attached to act as a handle. The edges will be extremely sharp and very hot after heating. By now, you realize the snow is several feet deep and the roads are impassable. In fact, so deep, snowplows cannot get out. Drifts are covering cars and obscuring the roadway. Abandoned cars will block streets and highways. It is not likely you will have to worry about break-ins nor is it likely there will be looters active. However, you should always follow sensible safety rules so they always remain a habit. Lock your doors, and ensure all windows are locked on the ground floor. Being prepared takes some of the stress away when disasters strike. There are times of course, when you are not prepared. However, staying calm and reasoning your way through the problem will save your life. Begin by preparing and educating yourself on survival tactics that have been used for literally thousands of years in some cases. Our ancestors used their hands and minds to survive in the hardest weather and conditions. You cannot bring an oak tree down by sheer strength alone; you can beat the tree for days with a stick to no avail. You must think through the problem and come up with solutions by using your mind and then your hands. Systematic problem solving techniques to overcome obstacles will help you survive, and also during every day life.